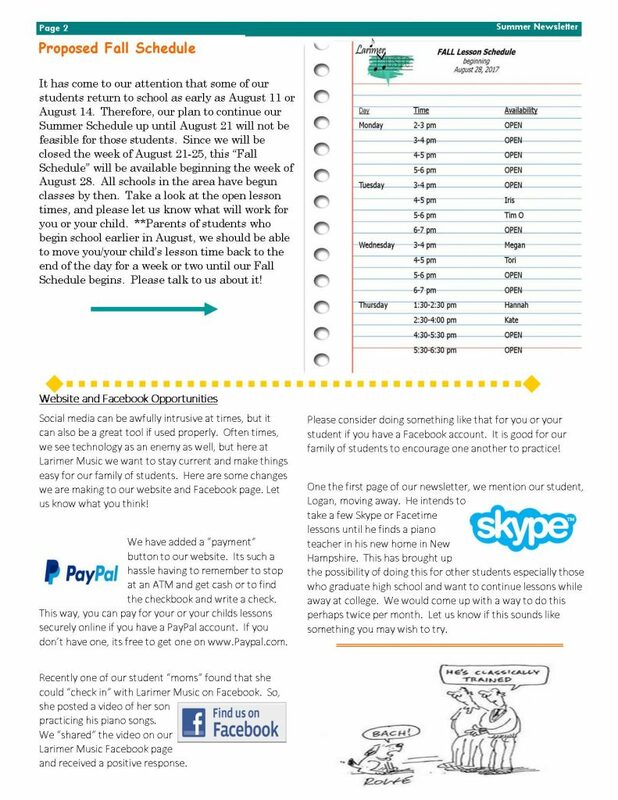 Exciting news–Larimer Music will begin its Fall Lesson Schedule tomorrow, August 28, 2017. We are open for business once again. 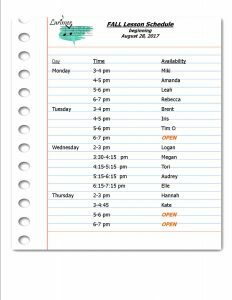 If you are unsure of your new lesson day/time, please refer to our Fall Lesson Schedule here: Can’t wait to begin working with all of you once again! 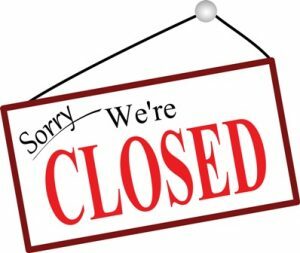 Just a reminder that Larimer Music will be closed August 20-27. We will begin our Fall Schedule on Monday, August 28. 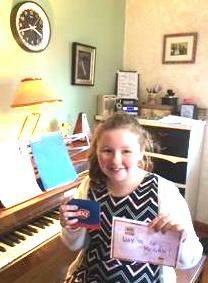 Congratulations to Elle–our Practice Minutes Winner for the month of July. 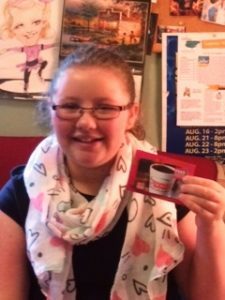 Elle won a gift card to Dairy Queen. Keep up the great work piano students, you are all practicing so much! Let’s see who will win for the month of August. 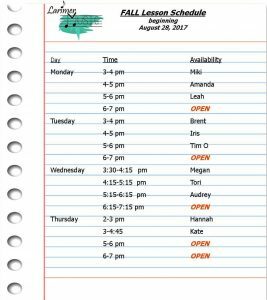 Here are more updates to the Fall Lesson Schedule! We still have 3 current students who have not signed up for a lesson time. 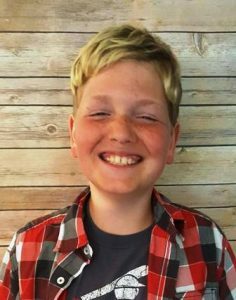 Recently, we have had several inquiries regarding lessons from new students. Open lesson times are limited, so please don’t forget to reserve your lesson day and time as soon as possible. Once all lesson times are filled, you will be placed on a waiting list. We don’t want that to happen to any of our current students–reserve your spot soon! One of our youngest students–Elle, who turned 7 last month, playing “Take Me Out to the Ballgame” as a duet with Ms. Laura. 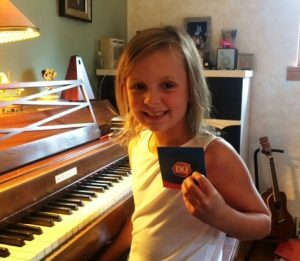 Elle loves this song and practiced very hard to learn it even though it’s a little more difficult than the songs in her beginner book. Absolutely fantastic job, Elle! 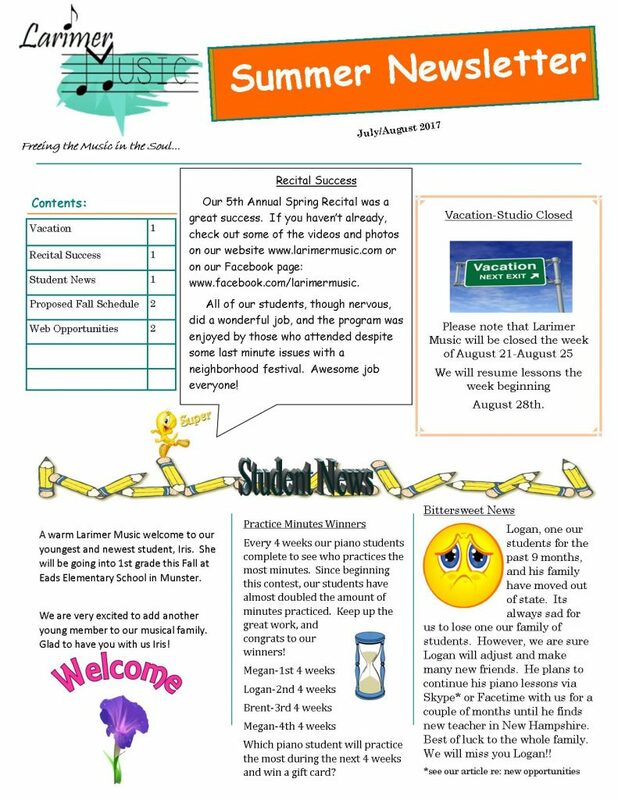 Here is our July/August Larimer Music Newsletter. Please note the upcoming Fall Lesson Schedule is in the newsletter. Already our students/parents are reserving their lesson time for the Fall. It’s going to be upon us in no time. Please read our newsletter, and let us know what day/time you would like for you or your child! We are now accepting PayPal payments for lessons via our website. Please note the PayPal button on the left side of our website. 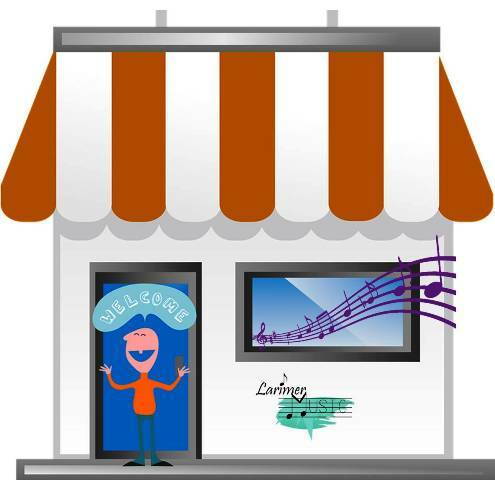 Basic lessons are only for those students who began lessons with Larimer Music prior to September 2016. After that date all lessons are “deluxe” unless you have been receiving a sibling discount. Please let us know if you have any questions. Please note that there is an extra fee for using PayPal to pay for lessons due to processing fees by PayPal. It’s not much more, and some of you may find that it’s worth the little extra for the convenience of paying online. However, if you pay for the entire month, you will not be asked to pay any fees. That’s the advantage of paying for a month at a time. Don’t want to alarm any of our students/parents but due to a failed abduction attempt yesterday only two blocks away from our business, our door will be locked during business hours. Please do not arrive at the front door until a couple of minutes before your lesson. Ring the bell, and please allow us a minute or two to finish the previous lesson to open the door. 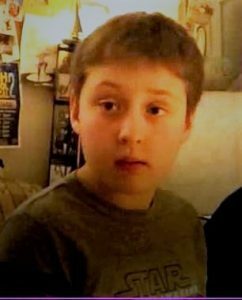 Parents, please don’t leave until your student is safely inside. The Munster Police are increasing neighborhood patrols. The safety of our students is super important to us. Thank you! 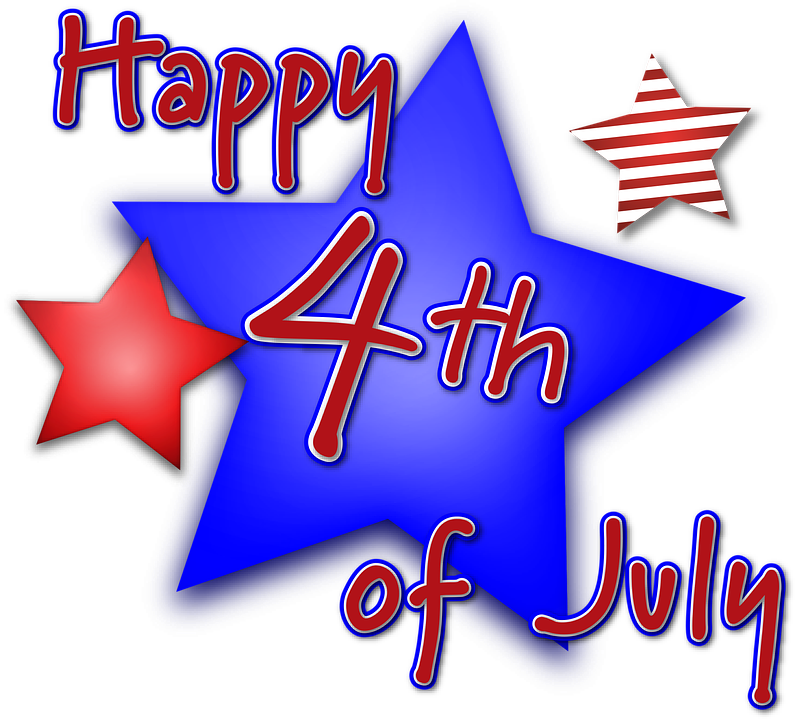 Just a reminder to all students and parents, Larimer Music will be closed on Tuesday, July 4 for the Holiday. We will reopen on Wednesday, July 5. Please mark your calendars! And . . .